Dubai’s investment arm has teamed up with one of the world’s biggest asset managers to create a US$1 billion (Dh3.67bn) property fund. The fund is the first “Dubai-only” property investment vehicle, according to a statement from Dubai’s official media office. It is to be seeded initially with $200 million – $100m each from Investment Corporation of Dubai (ICD) and the Toronto-based Brookfield Asset Management, a global alternative asset manager overseeing $150bn. Brookfield has an office in Dubai. The goal is to bring in a “select group” of other investors to increase the fund to $1bn. 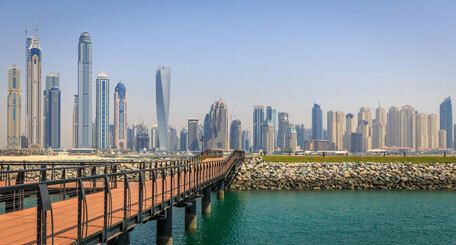 Dubai’s property market has been one of the worst-performing in the world since collapsing in late 2008. Prices have fallen by more than half in some areas of the emirate, and analysts at Arqaam Capital expect further declines of 15 to 20 per cent by the end of next year. While some investors have taken advantage of the market’s distressed condition and built up portfolios of cheap property, the fund that Brookfield and ICD have planned would be the first coordinated, government-backed effort to invest in the Dubai market since the downturn. There had been “lots of cash” looking for deals in Dubai but little evidence of organised fund investments, said Nicholas Maclean, the managing director in the Middle East for the property consultancy CB Richard Ellis. Deal-making has also been held up by a mismatch between buyer and seller expectations, he said. “People with cash have been disappointed they can’t cherry-pick assets,” Mr Maclean said. The Abu Dhabi company Tasweek Real Estate Development and Marketing said two years ago that it was aiming to raise $250m to invest in distressed properties in Dubai and the capital. The entry of ICD and Brookfield was significant, particularly because an international company was putting forward so much of its own money, said Gaurav Shivpuri, the UAE head of the property consultancy Jones Lang LaSalle. Mr Shivpuri said he expected the fund to focus on buying entire buildings. But the Dubai Government revealed little yesterday about how the fund would operate and did not say whether the deal was final. It was announced after ICD and Brookfield signed a memorandum of understanding, a kind of agreement that often outlines casual plans to cooperate but does not hold parties to firm commitments.